Is it incorrect grouping to include '13 with '11-'12 then, or are they the same across from '11-'15? '16? In USDM, at least, the 2011-12 are the same width as the rest of the world, but the 2013-15 are an inch or so wider, and the 2016 have an additional rear-view camera. difference is primarily that the EX has heat and the base doesn't, yes? do both have turn signal and power adjust? If so, and nothing different in shape to tell from outside, is there any visual cue to discern EX from base mirrors? Unfortunately some of the parts sellers don't know the trim level details of the donor car, and the part numbers given are just the ones stamped on the housing, which doesn't tell me much. There are lots of pics, though, so is the plug or anything different on the Ex vs base? 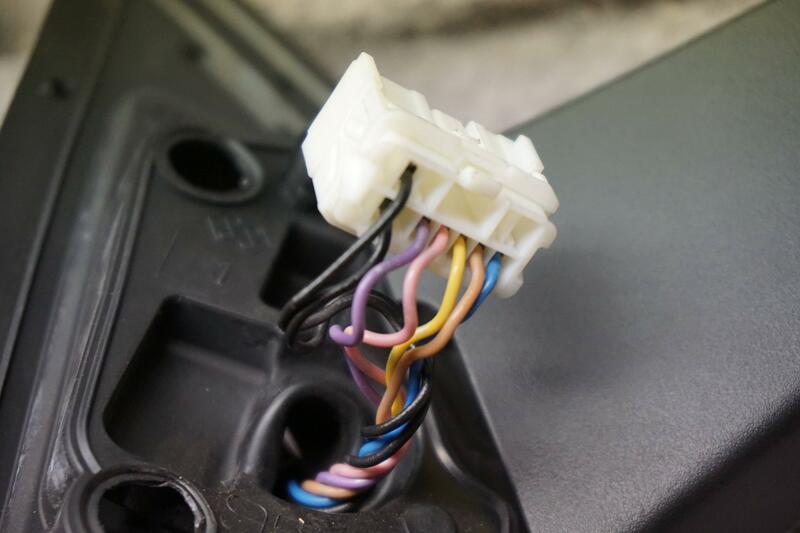 I've seen some with a blue plug and others with a seemingly larger white plug, and some that appear to have 5 wires (y,bl,br,pink, purp) while others seem to have additional black wires as well? Any way to tell by looking if it will be a direct fit for my EX? I figured the wires would sort it, unless what I noted is a difference in model year. I'm not aware of a new aftermarket mirror assembly for the same price/availability of the used OEM replacement. There's a bunch of em on ebay, but I dunno about how good they are...many of them costing less than a used oem assembly by about 30 bucks. I've put aftermarket stuff onto my civic and an impala mirror before. Sometimes the fitment is just a smidgen off where it should be which puts things out of whack, so it's probably best to go OEM even if I have to paint it. But WOW there is so much inconsistent info on these cars - nobody knows anything about them except those of us that actually own one, it seems. Almost every single listing on ebay has some wrong info in it, presumably because the people listing the parts are just going from what wrong information is in something else. There are clearly two black wires in a lot of the photos in listings which say their mirror is not heated, no matter what the year. In case anyone else needs to know a visual cue, I did a broader search for comparison of the mirrors and of the 111 results that came up there were enough that were photographed off the vehicle to try to see if a pattern emerged. Looks like the various mirrors --including the drivers side, despite the extended view on the later models -- will physically fit the bolts across all years, but the key is in the wiring harness - blue vs white. Blue connector looks like it has a different pinout, not even enough contacts to match up with the white plug. The one thing that seems fairly consistent from the pics is that the blue harness has fewer wires while the white has the two extra black ones. Stands to reason that Honda would make some way to identify the base from the EX assembly from a glance, so I am guessing that is it, unless anyone can say that their base model has a white connector or their EX has the blue one. If someone has a car that breaks that logic, I guess you can tell trim level the by the VIN# if they have that info available. And if anyone can figure out what the heck white stickers mean on the bottoms, I'm very curious to know - DA, DB, DT? Or maybe not even a D but some symbol that looks like one with a little hyphen line through the straight side of the D? I din't find any consistency in that pattern, but maybe my brain is overcooked. Another deviation is that other markets offer the electronic folding mirror option. See https://www.crzforum.com/forum/do-yo...tml#post154726 for more information, as he converted his USDM mirror to folding. Also, if you order a new OEM mirror, they are specific to colour for the part number, so no painting to match body colour needed. Also, if you order a new OEM mirror, they are specific to colour for the part number, so no painting to match body colour needed. The painted outer cover is just over $100 new, so you can get that OEM piece new, to replace the wrong color part of a cheaper mirror assembly that you might find used. I'm not sure how many wires are on the power folding ones, but ITEM9's description and pics in the link I posted will give you a better idea of what's needed for the conversion (more than just plugging in the "power-folding" mirror. One of these days, I'll be doing that conversion, but compare my pic of the wire connector in the previous post to the used mirror you want to buy. You might ask the seller to post a clear pic, if they don't show one of the connector, but I assume that most mirrors for sale will NOT be the wider width (extended view) mirror--so, watch out for that too. compare my pic of the wire connector in the previous post to the used mirror you want to buy. You might ask the seller to post a clear pic, if they don't show one of the connector, but I assume that most mirrors for sale will NOT be the wider width (extended view) mirror--so, watch out for that too. Yeah, despite my best efforts to ensure the proper match, I can't correct for what appears to be a glut of missing information on to the parts they are selling. i thought I had it covered with the connection match and number of wires to know EX from base, and the item being listed for '14 -'15 model years to be sure of the replacement for my 2013 passenger side, but as soon as my purchase arrived I could tell that the mirror was a good bit short in length so it might end up costing me a restocking fee on the return. Drat. it was even off a crystal black pearl car. what happened? did the 14- 15 folding kind not have the length of the extended view and I got one of those? or did the seller screw up and actually have a part from an '11 or '12? I was hoping be the later model year would by default have the extended view. This is very difficult to find. I might have to go with one listed specifically as being power heated extended view from another 2013 EX to be at all sure, no matter the color. I painted the panel after a scratch, it HAS to be easier than that.. If that particular one you got happens to be equipped with the auto-folding mechanism, I might be interested in buying it from you, since I'm going to order the parts/wiring from Japan to do that mod to mine. As for having to paint the mirror that comes in the wrong color, you can buy some carbon fiber vinyl to cover both mirrors, and that would look great too. If that particular one you got happens to be equipped with the auto-folding mechanism, I might be interested in buying it from you, since I'm going to order the parts/wiring from Japan to do that mod to mine.